This is so absurd, I almost having nothing to say about it. 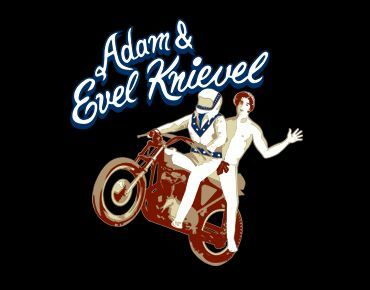 Based on the very thin humor premise of Adam and Eve(l), this design just removes the first woman out of the equation and drops Adam and his fig leaf on a bike with Evel. Pretty amazing stunt, because number one, it’s probably not easy to book Adam for such a gig. He’s a pretty popular guy. Two, most likely they’re trying to go for distance, like jump over the Garden of Eden, and that cannot be easy with two full-grown men.